Russell Westbrook is probably going to want that one back. Or maybe some of the other 15 technical fouls he’s picked up this season. The Oklahoma City Thunder star got more than a little heated during Saturday’s game against the Golden State Warriors, reacting to an awkward missed field goal attempt by slamming his body into Klay Thompson, who had been guarding him pretty closely. Westbrook was then hit with one of the least surprising technical fouls you will see this season. That was a costly foul for the Thunder, which were down 13 late in the second quarter, but it will be even more costly next game. Per The Athletic’s Shams Charania, Westbrook received a one-game suspension because he reached 16 technical fouls this season. NBA rules dictate that a player receive a one-game suspension once he hits that mark. The league could have rescinded the suspension, but the clearness of the tech and Westbrook’s past propensity for technical fouls made that a tough ask. Unsurprisingly, Westbrook had little desire to discuss the situation after the game. That’s the second punishment Westbrook has received this week, as he was hit with a $25,000 fine by the league earlier after verbally confronting a Utah Jazz fan. However, he received widespread support following that incident. 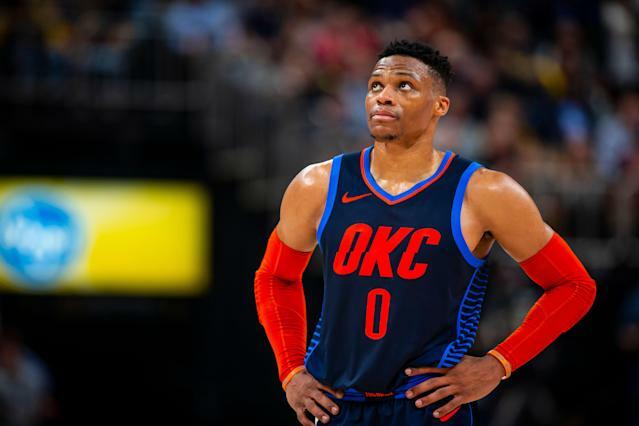 While the Thunder are safely in the playoff picture, they are still battling it out with the Houston Rockets and Portland Trail Blazers for home-court advantage in the first round, so even one game without Westbrook could be costly. Fortunately, the Thunder’s next game is Monday against the 32-36 Miami Heat, which wouldn’t be the worst team to take on without your star point guard.